That's right, folks - LOOT FOR ME! 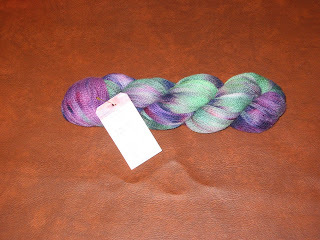 In today's mail I received this skein of merino wool from Random Michelle. I usually knit with the senior center's castoffs, so this is fancy-shmancy for me. Loot, Loot, Loot for ME! Thanks, Michelle! Hand dyed in West (by God) Virginia! I saw that, remembered that you knitted, and thought maybe you'd like it. I meant to send her "bookmark" along. Has her website I think. Obviously I forgot. Oooh, pretty colors! I like bright! Learning to knit is on my list of things to do before my next birthday. That's a right fine skein of wool there. Ooo merino.